Some smart phone manufacturers don’t allow their devices to be used in cold weather while others guarantee smooth functioning even in -20 degrees Celsius (-3 degrees Fahrenheit). According to Apple, its iPhones can be used only in temperatures between 0 and 35 degrees Celsius (32 to 95 F). In other words, an iPhone user taking his device outside in typical Canadian winter conditions will do so at his own risk. If the phone breaks down, Apple claims they will not be responsible and it is not covered by the phone’s warranty. 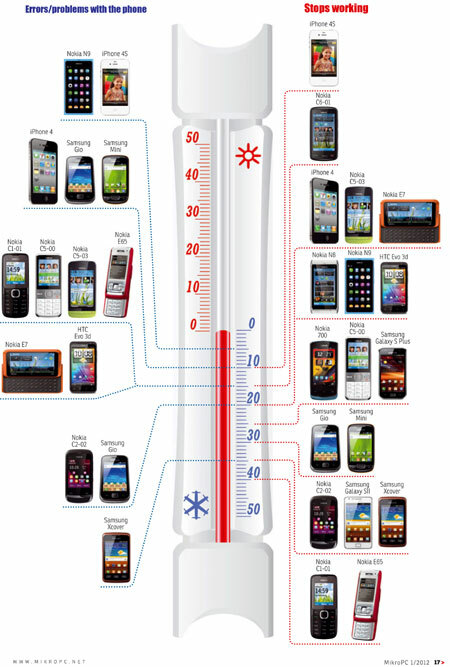 HTC and Nokia have not given out operating temperature guidelines in user manuals or on their websites. Samsung, on the other hand guarantees its phones to function in temperatures between -20 and 50 degrees Celsius (-4 to -122 F). How does your smartphone stand up to cold temperatures? Click here for larger image. MikroPC (PCWorld Finland) decided to test if the manufacturers can back up their claims in real life. We picked up the 15 most-sold mobile phones in Finland and three others for comparison, and took them into the Technical Research Centre of Finland and their “Weather Room”, a specialized research lab where the temperature can be adjusted to a fraction of a degree. The initial temperature was set to 0 degrees Celsius (32 F). From there, we kept lowering it by steps of five degrees Celsius (9 F) until even the most persistent devices gave up and stopped working. At 0 degrees Celsius / 32 F, it was business as usual. At -5 C/23 F, iPhone 4S and Nokia N9 started showing symptoms: the iPhone reported a sim card error and the N9 claimed its battery was nearly empty. Lowering the temperature even further to -10 degrees Celsius / 14 F was more than the iPhone could handle. The Apple device suddenly announced a dead battery and shut down. All phones with LCD displays experienced difficulties when the temperature dropped below this. Amoled displays proved to stand cold much better and kept on going. In addition to displays, the dropping temperature also affects the device’s connections. The majority of smart phones couldn’t handle temperatures colder than -15 or -20 degrees Celsius / 5 F to -4 F. Even if they managed to stay on, most died when put to actual use. Feature phones did better. Apart from slowness in the display, they showed no symptoms until the temperature dropped to -25 C / -13 F. By this time most smart phones were completely useless. Against all odds, South Korean Samsung smart phones outlasted Finnish Nokia’s touch-screen devices. Only one of the smart phones we tested kept running smoothly when the temperature reached -30 C / -22 F, and it was a Samsung. Even if Korean engineers don’t face such temperatures as often as their Finnish colleagues, they’ve managed to design a better phone for such conditions. Galaxy S II doesn’t shut down until it is -35 degrees outside. And until that point, there’s not even a sign of slowness in its display. -35 degrees Celsius / -31 F proved to be the ultimate limit for smart phones. Even the most persistent one, Samsung Galaxy S II, shut down when we tried to use the phone. None of the tested touchscreen smartphones could stand such extreme conditions. But, perhaps surprisingly, some feature phones did work, even though their LCD displays showed serious slowness. But when the temperature dropped to -40 C / -40 F, none survived. Even the toughest ones shut down. Out of the 18 phones we tested, only two feature phones could survive until these temperatures: a very cheap Nokia C1-01 and a five-year-old Nokia E65, which was one of the devices chosen for comparison. In the end, the Finnish engineers did design the best mobile phones for sub-zero environments. They may not be equipped with high-end touch-screens, but they work! And it’s probably not a surprise: the coldest temperature in Finland peaks at -40 degrees almost every winter. When the temperature drops enough, a cell phone thinks that its battery is empty — even if it’s fully recharged — and shuts down. A chemical reaction takes place inside the battery. The product of the reaction is electrons, and the flow of electrons creates an electric current which the cell phone uses as its source of power. The speed of this reaction depends on the temperature: the colder it gets, the slower the reaction, and the smaller the current that the battery can provide. The voltage of the battery isn’t stable, either. The nominal voltage of a lithium-ion battery is typically 3.7 volts, but in reality the voltage is between 2.7 V (empty battery) and 4.2 V (fully charged battery). In cold temperatures the internal resistance of the battery grows, causing the output voltage to drop. When the voltage drops too low, below a threshold voltage, the cell phone thinks the battery is empty — even it is fully recharged — and shuts down. An LCD display consists of layers. The actual liquid crystals are positioned between the polarizing filters and electrodes. A TFT layer (thin film transistor) is positioned behind the screen to control the pixels of the screen. When the temperature drops, the viscosity of the liquid crystal material grows exponentially. Depending on the material used in the liquid crystals, the viscosity grows 2-3 times larger when the temperature drops 10 degrees Celsius (18 degrees Fahrenheit). This means the pixel changes its color slower in the cold. When it’s cold enough, the pixel acts so slow that it can’t change its color fully before the next frame is already drawn on the screen. This is when the display seems to work slowly and ghosting or image blur appears on the screen. In AMOLED displays the colors are produced with a layer covered in organic material, organic light emitting diodes. This lack of liquid crystals explains why AMOLED displays work better in the cold.